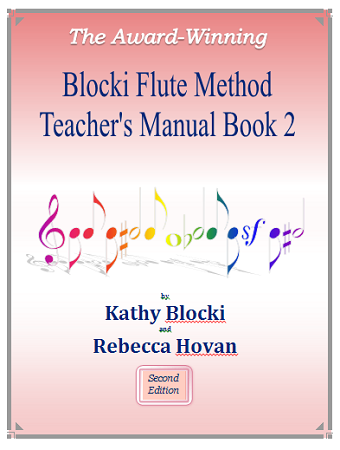 This award-winning Teacher's Manual is essential for teaching the award-winning Blocki Flute Method Book 2. The manual begins by giving detailed instructions on to how use the Foundation Pages and the "fill-in-the-note" method for each new rhythm pattern, beginning with two beat eighth note patterns. The page-by-page instructions are filled with ideas such as using harmonics, practice techniques, creating variations, and historical insights. Also included are instructions for solving tone problems, and teaching techniques such as vibrato and double tonguing. Enharmonic note spellings such as E-sharp and C-flat are often first encountered in difficult literature, making is hard for the student to know if they are making a mistake. The Blocki Flute Method introduces these new notes spellings in easy to recognize pieces such as Jingle Bells or Three Blind Mice to ensure that students can easily hear when they make a mistake and quickly correct it. The book includes: Il Est Ne (a French Carol), The Chase!, Austrian Folk Song, Silent Night, the beautiful Korean melody Airirang, Maple Leaf Rag, Bach Bouree, Russian Sailors’s Dance, the fun “To Be or Not to Be”, Theme from Master Piece Theatre (Mouret), Dona Nobis Pacem, Czech Dance, Schumann’s Happy Farmer and the Wild Horsemen, In the Hall of the Mountain King, Haydn’s Rondo, Mozart's Burlesque, Scottish Piper, Deck the Halls, Italian Wedding Dance (Tarantella), Turkey in the Straw, The Entertainer, Can-Can, Drums and Fifes, Gounod’s Funeral March of a Marionette, Theme from Carmen, Up on the House Tops, Jolly Saint Nick Theme and Variations (great to play for an ensemble of mixed ability levels)…….and many more pieces!